This course reviews the basic principles of blackwork, to create these elegant Spring Tulips. In addition to the dimensional stitching, you will be working with tulle, fabric markers, fabric paint and embroidery floss on 32 count linen. EAC has a kit option available for this new project course. 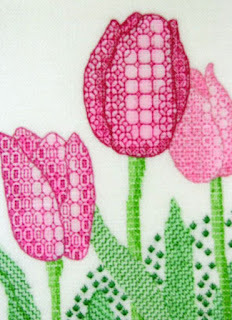 Get all of the Spring Tulips details on the EAC website.